Thursday January 31, 2019-A vocal Jubilee Party MP has slammed Mombasa Governor, Ali Hassan Joho, for insulting Deputy President William Ruto. Over the weekend, Joho, who was speaking in Busia County, claimed Ruto is a patented thief of public money and urged Kenyans not to support his presidential bid in 2022. However in a rejoinder Kapseret MP, Oscar Sudi, told off Joho and said he should stop attacking the DP. 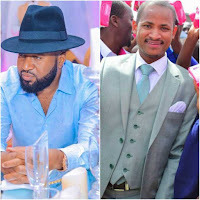 In a statement on Wednesday, Sudi said Joho and Embakasi East MP, Babu Owino, are gays and drug barons and they should stop soiling the good name of the DP. “We have always supported the handshake and the Building Bridges Initiative. I am one of the first legistlators to applaud the initiative and I am on record defending the same. However, some section of leaders from ODM have exhibited selective embrace and have further confirmed this by launching scathing attacks towards the Deputy President. The latest incident where Governor Joho was caught insulting the Deputy President is unfortunate and should be condemned with contempt it deserves. We cannot allow the Deputy President to be turned into a daily punching bag by some few crooks and dishonest leaders. My colleague Hon Babu Owino has came out in defense of the crook Governor calling other leaders names. That was expected of him bearing in mind that Babu himself is allegedly Joho's wife (shoga). We are also aware that Babu Owino was a close associate of Joho at the helm of rampant drug business. Babu being a student leader was a peddler in charge of illicit drug operations in University of Nairobi and its environs. I challenge anyone to inquire this from UoN and you'll be shocked. They are partners in crime (wanajuana kwa vilemba) and Kenyans should not take their comments seriously. I want to reiterate once again and urge the government to move with speed on extradition of drug barons who together with Akasha brothers conspired in establishing the illicit drugs network in Kenya."